Awesome news … on behalf of Terry McGee from PC Pilots Ireland, we’re pleased to inform you that from todays issue we offer you their PC Flight Magazine for free. For those not familiar with the PC Pilots Ireland and our magazine, here’s a brief history. The PC Pilots Ireland has been in existence sine 1993, when Ian Broni and Terry McGee decided to start a Flight Simulator Club, the ‘PC Pilots Club of Ireland’, to share our interest with other like-minded people who used Microsoft Flight Simulator and Laminar Research X-Plane. All articles and reviews in our magazine are provided to the flight simulator community. “Summer time, and the livin’ is easy”. This Summer we here in the Emerald Isle are enjoying unusually hot weather at the moment. It’s so good that I found it difficult to work on this issue. Thanks to the team, we have a few reviews for you to enjoy: The most iconic airport in Microsoft Flight Simulator, Meigs Field, is now available for Aerofly FS2, a collaboration between Orbx and IPACS. John McNeely has a brief review of it in this issue. Philip Wafer reviews ‘Fly the Maddog X’, which you can fly to Bari X for a virtual holiday or make your way over the Atlantic to FlyTampa’s Boston Rebooted v4. For X-Plane users, you can practice your VOR approaches at FlyTampa’s Corfu. 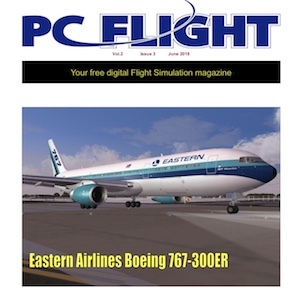 PC Flight offers many interesting articles, and yes, it does offer also articles we’re not interested in namely related to Microsoft, but there’s also a lot that’s related to X-Plane and that’s great news. On behalf of Terry and his team as well as myself, give it a try, download this March issue and see if it offers something for you.